The winter season can take its toll on your lawn, with temperature drops and dry winter winds causing brown or dead spots that are a real eyesore. Now that spring is on its way, your lawn can use a little extra care to ensure that it recovers from any winter damage and gets off to a strong start for the growing season ahead. If dead plant material is visible in your lawn when spring arrives, the best thing to do is to cut it out. The first order of business is to remove any leaves, rocks, sticks or other debris. This should be followed by a short mowing - short enough to cut out dead plant material and spur new growth. For your first mowing of the year, it's a good idea to lower your mowing height by one or two notches and to mow in several different directions. In addition to removing dead plant material, this will help to prevent thatch build-up. After the first mowing, your lawn will greatly benefit from an application of balanced fertilizer. This will help your lawn to quickly outgrow winter damage and to bounce back from any fungus diseases that may have attacked while the grass was dormant. 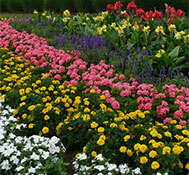 For more information on early spring lawn care, give us a call today. We're here to help keep your lawn looking and growing its very best! We are pleased to announce the creation of our Facebook page - one more way to stay in touch with Vizmeg Landscape and even take a glimpse at some of our work. Please stop by our page and "LIKE" us! We will be posting company updates, job postings and landscaping tips. Landscape improvements can make a tremendous difference in the look, usefulness and value of your home. And what better time than spring to consider these types of improvements! No matter what the style or size of your house, your property or your budget, landscape designers can offer ideas to fit your lifestyle and needs. Planning your landscaping needs usually involves either a simple site sketch, a partial site drawing, or a master plan. Although all three types of plans can work well in different situations, creating a master landscape plan offers you several advantages. 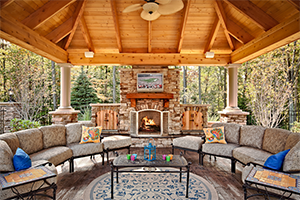 Your landscape is made up of separate parts - walkways, hedges, trees, patios, storage areas. However, each part should relate to the others and to the look of the entire neighborhood. 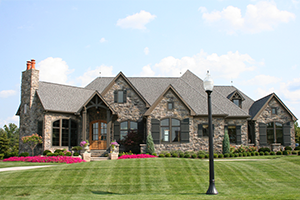 A master plan considers all the parts of your property as a single “site” and ensures all of your landscape projects will work and fit smoothly together. Even if you only plan to complete a few improvements immediately, creating a strong overall plan early can save you significant time and money over the long term. With a master plan, you’re able to complete parts of the plan in stages or over several years, as you are ready. You will find that with an overall plan, it is easier to set priorities, and individual projects or sections of your landscape can be done more quickly because they’re already laid out in the plan. Remember, landscaping can dramatically affect your quality of life. Even small projects now can make a difference. And with a master plan, you have the option of tackling the later, larger improvements at your own pace.